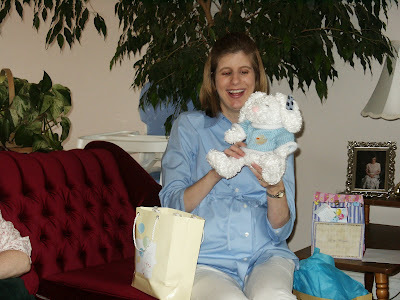 This is me, about six months pregnant with our son who was born in the summer of 2003. Our church family at the time was in Fredericton, NB and a close friend hosted a baby shower for me. This bunny became a favorite with my husband who impersonates our stuffed animals and gives them a distinct personality. This bunny was always asking me if I'd like to touch his soft furry back hidden under the sweater. And the bunny doesn't shut up until you say yes and pet his back. LOL.